Me and snow had a little problem over the weekend. More on that later. 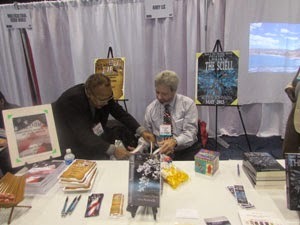 Before that nasty blizzard hit Chicago, I had an amazing time at ALA's Midwinter Meeting. I had one monster of a...let's call it an adventure getting from my home in Brooklyn to the hotel in Chicago. I got lost 3 times. Once I got off the subway in Queens, I transferred to a bus to LaGuardia. I got on the right bus going in the wrong direction. Ended up back in Manhattan. Such a rookie mistake. On the bus going to LaGuardia, I got off at the wrong terminal. Had to take a shuttle to the right one. 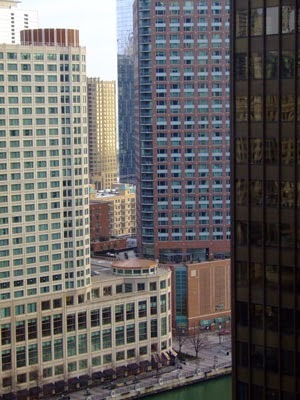 In Chicago, I got on the wrong shuttle and went to the wrong hotel. Had to take a cab to the right hotel. It was ridiculous. It's not like I haven't traveled before. The flight was...terrifying. Since planes keep vanishing, I was imaging all the bad things that could happen. What was worse. The cabin smelled like fuel. I was freaking out. At least the hotel was nice. And I had a great view. The weather in Chicago, at the beginning, wasn't that bad. For those on Instagram, travelling pics work. 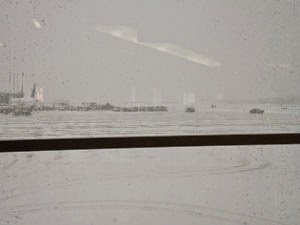 If you're going to an author event or even out of town for fun, take pictures of things outside your window or the airport. If you're on the train, take a nice pic of the track. For ALA, I wanted to do something different. 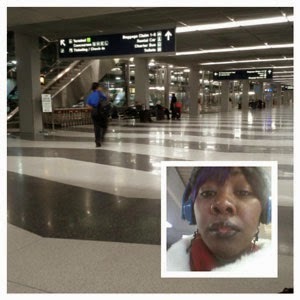 Instead of just posting pics, I created these with Photo Grid- iTunes Google Play. They're travel pics + my reaction to them. They were the most liked of all the pics I posted over the weekend. Back to ALA. I was excited for my hair. 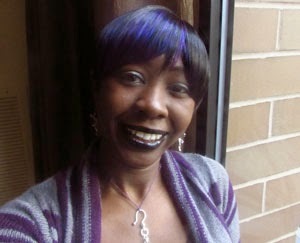 I always wanted purple and blue streaks. I came down with a case of the nerves Saturday morning. As soon I finished dressing, I felt more confident. Funny what nice hair and your favorite outfit can do. 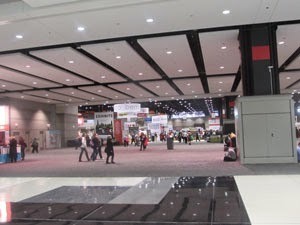 The Midwinter Meeting looks a small BEA with no lines. It's more for networking. People still walked around with handfuls of books. 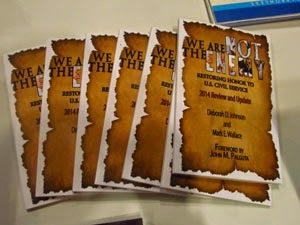 Aubey released a new book We Are Not The Enemy. I'm happy to say the cover I designed caused people to stop at our booth. Creatives don't often get to see reactions to our work. It was nice to see that the cover worked. 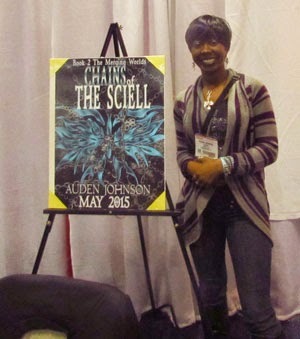 People still like The Sciell's cover! 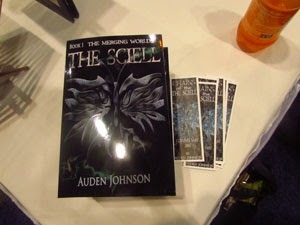 The Chains of the Sciell bookmarks were nice. I took one for myself. 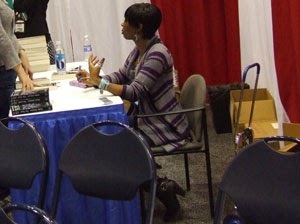 I was there to help manage Aubey's booth. We sold some books, talked to people. It was a good day. 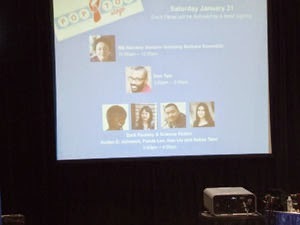 Mostly, I was looking forward to my first panel. 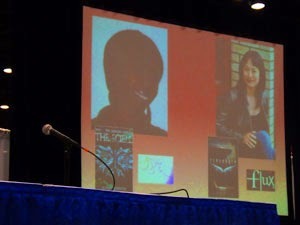 I talked Dark Fantasy and Sci-Fi with Fonda Lee, Ken Liu and Sabaa Tahir! It was nice seeing my face on the big screen. Even nicer when my face took up half the screen. Good thing I chose a nice pic. 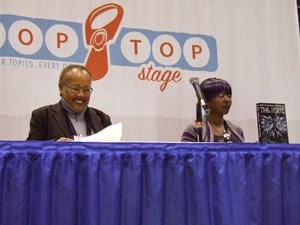 The panelist were awesome. The place was packed. The audience asked some great questions. Book signing afterwards was even better. I had a line of people wanting my book. From the response, I think I did well on my first panel. It was a lot of fun. And I made a business connection. An author self-published a book but doesn't know what to do next. 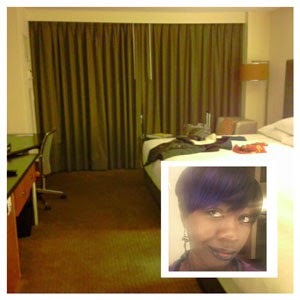 I talked with her a good while about social media marketing and getting reviews. The adventure didn't end there. 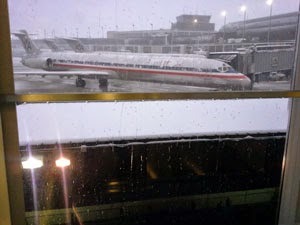 A blizzard hit Chicago yesterday--the day we headed home. My flight left on time. My parents...their flights got canceled. The roads were a mess. The airport looked like something out of an apocalyptic movie. I was already scared and then this happened. I got home safe-- late but safe. My parents are still stuck in Chicago. On top of that, once again, NYC is in the middle of another winter storm. For authors struggling to get attention- wondering if your hard work is worth it- keep at it. The Sciell was released last year. The second book is about to come out. My publisher kept suggesting me for panels and they kept getting turned down.